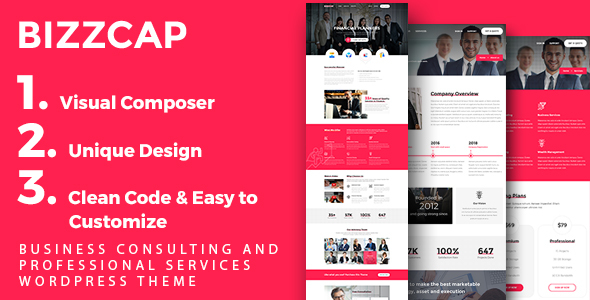 Bizzcap is a clean and Modern WordPress Theme. It’s a clean and beautifully designed WordPress theme that is an ideal fit for Financial Adviser, Accountant, Consulting Firms, law, retirement, insurance, loan, tax help, Investment firm etc. This is a business template that is help full for online presence for Corporate Business and Financial Firms. Contact form 7, WPML, All in One Calendar, Events manager Pro, Gravity Forms, WooCommerce, Yoast SEO, All in One Seo Pack, W3 Total Cache, WP Super Cache, JetPack, Disqus, Geo Post, Ultimate Maintenance Mode, NextGEN Gallery, etc. Images used in the demo are not included in the archive of the ? for the license restrictions. They are replaced by dummy placeholders. This is a great way to ask authors about their item or offer some creative feedback.